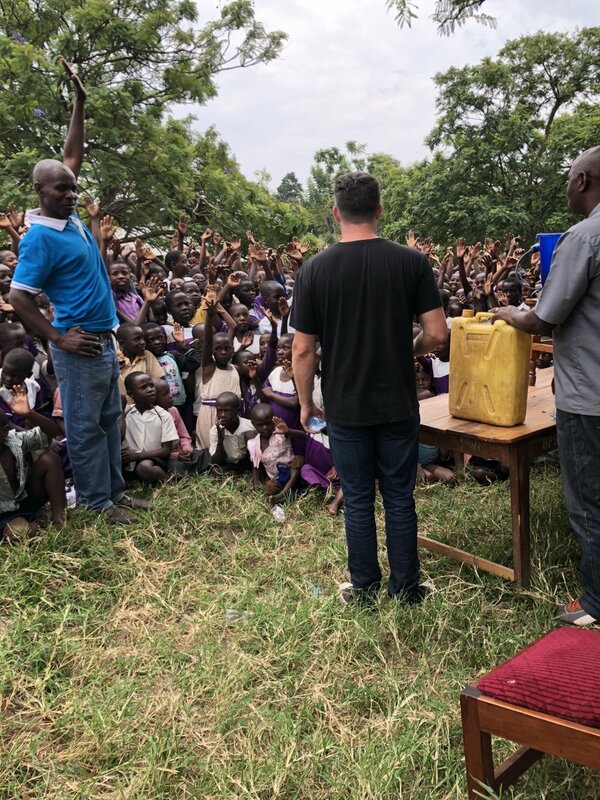 Following three days of travel in early August to reach our destination while transporting 1,000 water filtration devices across the globe, the One ATTA Time team arrived in Uganda. Our journey took us south of the equator to southern Uganda, in the Rukungiri District, one of the oldest Districts in Uganda. This District is an area that is predominantly agriculture with smaller areas of high tropical forests, woodland, bush land and grassland. Approximately 95% of the people in this part of Uganda live in rural areas without access to electricity, and thousands of people do not have access to clean water. In the Rukungiri District, elevations range from approximately 2,000 to 6,000 feet, making hydration even more important for the health of the children due to the increased need to drink clean water at higher elevations. We first targeted the poorest families with the greatest need for clean water. There are so many young children in this area whose quality of life is poor due to water-borne illnesses that can be prevented with the water filtration systems that ATTA brings to them. The diseases that these children suffer are literally washed away with the simple, yet powerful Sawyer filtration systems made possibly by our One ATTA Time sponsors, partners and leaders. The local leaders and ATTA team had the privilege of seeing the wonderful smiles of the children and the lifted spirits of their families who were taught to properly care for the filtration systems for many decades of use. Clean water brings them so much... health, life, hope and the peace of mind that the children’s physical health will be greatly improved. One ATTA Time is thankful for this most recent opportunity to take the filters to Uganda, which will impact 6,000 people by providing them with access to clean drinking water for the next 20 to 40 years. This means that nearly 2% of the population of Rukungiri District has been provided with access to clean water and better health by ATTA and our partners and sponsors this month. The trip was planned, led and implemented by ATTA’s Executive Director Sean Kappauf, Pamula Shero, Nicole Carter, Norm Bennett, Patrick DeVusser and Elyse Snipes, who have opened their hearts and dedicated their time to the children of Uganda in an effort to bring them health through clean water. But this is only the beginning. We have so much more work to do in helping those in Uganda. According to the Uganda Bureau of Statistics, the estimated population of the Rukungiri District in 2017 was 322,500 people and 271,118 live in rural areas with only 43,576 in urban areas. In the 2014 National Population and Housing Census published by the Republic of Uganda for the Rukungiri District in April of 2017, statistics were provided showing that out of nearly 70,000 households, only 20.6% of the households in the Rukungiri District had access to piped or well water at all--the rest rely on surface water in contaminated swamps and ponds or dirty roadside runoff. Adding to the poor water quality and health issues, only 1.2% had toilet facilities, only 15% disposed of solid waste properly and 98% of the households in the District were not living in decent dwellings. We have so much more work to do in Uganda, as well as in other areas across the world that are in desperate need of clean water. Join us as we bring healing to children around the world.